An international team of scientists from the National University of Science and Technology "MISIS", the Central European Institute of Technology and several other universities has developed a biocompatible material with antibacterial properties. The material is planned to be used for bandaging of wound skin, for example, burns and cuts. Such bandages will have a prolonged effect, act locally and, most importantly, will not require changing. The material is self-absorbable, and a new bandage can be put directly on top of the old one. The article about the research is published in Materials and Design. 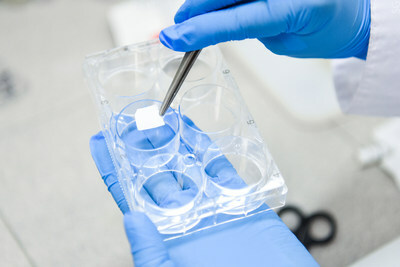 Scientists from the National University of Science and Technology "MISIS", Central European Institute of Technology and several other universities have developed a biocompatible dressing material that is able to act locally on the focus of inflammation, and does not require change. Releasing the antibiotic, the bandages will gradually dissolve on the skin. If necessary, a new bandage can be applied directly on top of the old one. "As a basis for our material, we used polycaprolactone nanofibers, which are self-dissolvable. We attached gentamicin, a broad- spectrum antibiotic, to the fibers. Interestingly, the effect has turned out to be prolonged: we observed a significant decrease in the number of bacteria even 48 hours after the application of the material. Usually surfaces with antibacterial effect work only during the first day, often even the first hours of application," - Elizaveta Permyakova, one of the authors, researcher at NUST MISIS laboratory "Inorganic Nanomaterials". As noted by scientists, potentially the material can be used not only for the skin treatment - it can also be used in the treatment of inflammatory bone diseases such as osteoporosis and osteomyelitis.